The Hope Industrial Workstation System allows for thousands of combinations of touch screens, monitors, keyboards, mounts, and enclosures to create the ideal computer-based HMI for any application in a factory environment. With so many options, the easiest way to configure your perfect solution is to contact our highly trained sales team who can discuss your environment and suggest options and alternatives. The following guide outlines the steps to create your own configuration. Hope Industrial Workstations consist of a display, a cable exit, cables, a monitor mount, and any necessary options (industrial keyboards, PC enclosures, KVM extenders, etc). To complete a monitor configuration, select from each of the following sections. Item numbers and pricing can be found in the "Ordering Info" section of each linked product page. 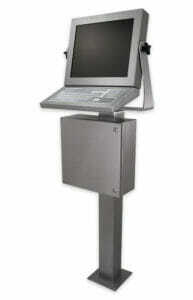 Select the base monitor or touch screen from any of our Universal Mount Monitors. Options include size, material, IP/NEMA rating, and window options. All monitors require a Cable Exit Plate to seal the rear cable cavity. Options include conduit, compression glands, or blank plates with pre-drilled pilot holes for use with customer-provided cable exit glands. For conduit, full assemblies are available containing all necessary cables, conduit, and fittings pre-assembled and ready to install. These conduit cable assemblies are available with USB or CAT5 (for KVM extender) data cables. When one of these options is chosen, you must also choose the correct regional power plug; no other cable selections are required. All monitors require power and video cables (analogue or digital). Touch screens also require a touch cable (USB Type A-M to B-M, or Serial). Monitor-Mounted Keyboards require a USB extension cable, Type A-M to Type A-F. When a conduit assembly is chosen, only a regional power plug must be selected; all other cables are included in the assembly. Universal Mount Monitors have side yoke mount points and a rear 100mm VESA mount pattern. Mounting options include pedestals, articulating wall arms, mounting yokes, and light industrial VESA options. Keyboard options are available for mounting directly to the display, to a wall, or for placement on a benchtop. Industrial Enclosures for Thin Clients and PCs allow placement of a non-IP-rated PC directly at the operator station and can be mounted to a pedestal base or directly to a wall. Monitor-Mounted KVM Extenders allow the workstation to be placed up to 300 m away from the computer. Screen Protectors provide additional touch screen protection in tough, dry environments.